Yay! It’s Halloween weekend! I love this holiday, it’s filled with silliness, creativity, and treats! I love the buzz of energy everyone has surrounding this holiday, people are excited and aren’t drained yet (mentally, physically, or monetarily) from the holiday season. I feel bad for Valentine’s day, it really got the “short straw”, by that time everyone is wishing they didn’t spend/eat as much as they did. But not at Halloween, it’s just beginning of a season filled with magic! Each year I hand out candy to all the adorable trick-or-treaters, I carve pumpkins and I make a Halloween inspired meal to enjoy. It’s a day full of creativity and homemade fun! My favorite! This year I made Spooky Halloween cupcakes. The cupcake base is a delicious rich chocolate that will most likely leave you desperate for a glass of milk. The frosting is a quick and simple vanilla frosting that compliments the cake just right. Now, the decorations on top of the cupcakes is up to you to decide, just be creative and don’t hold back! Pour batter into cupcake dish, filling just below the top of each liner and bake for 20 minutes or until toothpick inserted in the center of cake comes out clean. Watch cupcakes carefully, do not over bake. Cut a tiny corner off of a large Ziploc bag and place large circular frosting tip inside the bag. Fill the bag with the frosting and get to decorating! 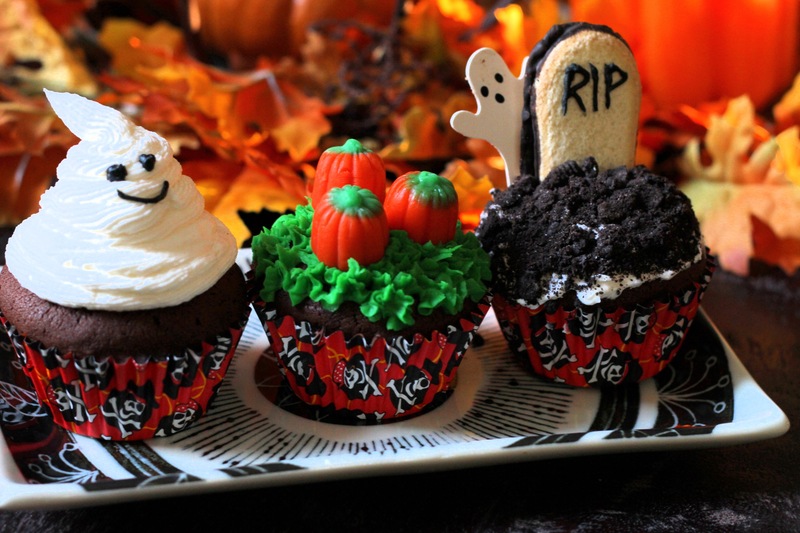 Spooky Graveyard – Frost a thin layer of vanilla frosting on top of cupcake. Crush Oreo Cookies (sans filling) and spread on cupcake. With black frosting write “RIP” on a Milano Cookie and insert into cupcake. Place a paper cut out ghost on a toothpick slightly behind the cookie. Pumpkin Patch – Reserve a small amount of vanilla frosting and place in a separate bowl. Add the desired amount of green food coloring. Then cut a tiny corner off of a large Ziploc bag and place a star shaped frosting tip inside the bag. Fill the bag with the frosting and frost cupcake then place 3 pumpkin candies on top. Ghost – Take large bag of vanilla frosting with large circular frosting tip and in a circular motion frost cupcake with a large mound. Then take black frosting to create the eyes and mouth. I love the lil’ ghost guy!